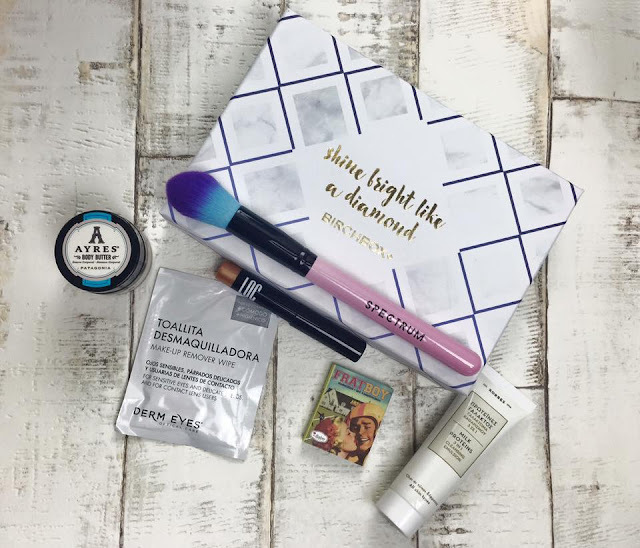 This month BirchBox teamed up with Spectrum Collections. Spectrum collections are a brand who sells really pretty makeup brushes. I have their Glam Clam brush set which is so pretty and amazing quality so I was super exited to see they had teamed up with BirchBox this month. This brush is such a gorgeous colour, it is really well made and is so soft! As mentioned above I have some Spectrum Collections brushes already and I love them so much. I thought this brush would be so good for packing on powder under my eyes. This eyeshadow stick is so pretty! I haven't yet used it but I have swatched it and it felt so creamy to apply so I am really excited to try it out more. The shade I got is Champagne Problems which is a really pretty gold. This product is a cleanser and toner which you use to remove your makeup. I have heard amazing things about this brand so I am really looking forward to being able to try out one of their products. I think this product will be perfect for those evenings when I am feeling too lazy to carry out my full skincare routine. The Balm is by far one of my favourite brands, not only are the products amazing but the packaging is so adorable. I have gotten a sample like this in a previous birchBox and I really liked it so I am really happy to have received another one. Frat Boy is also one of The Balms more popular blushes. What intrigues me most about this product is it is made up of natural ingredients. When I smelled this in the jar I really wasn't keen on the scent, but after applying a little to my skin and rubbing it in I really enjoyed the smell. The scent is so relaxing and I think I will apply this after having a bath in the evening to really wind down. What I love most about this body butter is that not only does it leave my skin feeling amazing but it also doesn't leave that horrible greasy layer on my skin, It sinks in so quickly leaving my skin feeling so silky smooth. These makeup remover wipes were this months beauty bonus, I haven't yet tried it out but I am really excited to. These makeup remover wipes are supposed to gently eliminate all traces of makeup. What I find most interesting about these makeup wipes is they are hypoallergenic cleansing wipes which are perfect for people with sensitive eyes and skin. Do you subscribe to BirchBox? What was your favourite product form this months box?